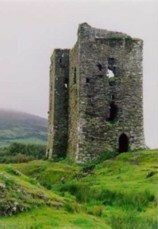 Dunmanus Castle, one of thirteen castles on the Mizen Peninsula in Southern Cork, Ireland. This was one of the castles the O'Mahoney's built and were rulers of the area from the 9th century to the 15th century. This family starts with William MAHONY, who was a labourer, and his wife, Catherine DUNN. Not much is known about them other than that there is one known son, Michael MAHONY. 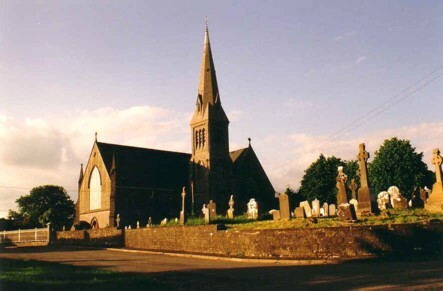 Michael MAHONY was born about 1857 and married Bridget HEFFERNAN on 1 March 1878 at the Catholic Chapel of Sollohed in Tipperary, Ireland. At the time of the wedding, Michael was a Railway Porter living in Limerick Junction, Tipperary. Bridget HEFFERNAN was born about 1860 in Tipperary. At the time of her marriage she was living at Ryle, Tipperary, Ireland. Her parents were Michael HEFFERNAN (who was a labourer) and Catherine RYAN. Details about their sixth child are not known. At the time of their emmigration in 1887, shipping records state that the family was living in Kings County, Ireland. 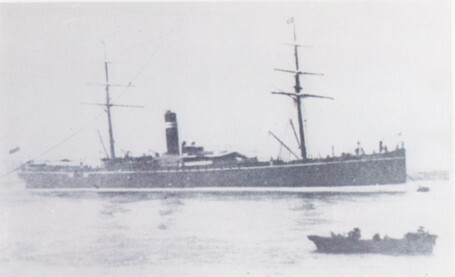 On 12 November 1887, Michael and Bridget, with their five children, left London, England on the SS Dacca, arriving at Moreton Bay, Queensland, Australia on 5 March 1888. Their first place of residence was in Mount Morgan, Queensland. After their arrival in Australia, they did have one more child, Michael MAHONEY, who was born on 15 April 1889 in Rockhampton, Queensland. Michael MAHONEY (father) died on 20 January 1902 in Queensland from Tuberculosis and was buried the same day in the North Rockhampton Cemetery in Rockhamtpon, Queensland. His wife Bridget died on 16 February 1908 in Rockhampton during an operation at the hospital and was buried with Michael two days latter. Catherine MAHONEY was born 23 December 1880 at Limerick Junction, Tipperary, Ireland, and with the rest of her family, came to Australia in 1887. Margaret Marstella MAHONY was born on 15 February 1886 in Fermoy, Cork, Ireland 1886 in Ireland and came to Australia with the rest of her family. 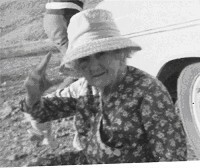 Edith Agnes MAHONEY was born on 20 September 1904 in Rockhampton, Queensland, and died on 19 March 1995 in Rockhampton, Queensland. It is known she did not marry or have any children. female MAHONEY. This person could still be alive so available details have been ommitted. male MAHONEY. This person could still be alive so available details have been ommitted. Clarence Robert MAHONEY was born on 18 December 1910 in Rockhampton, Queensland and died on 8 August 1965 in Brisbane, Queensland and was buried two days latter in the Pinnaroo Cemetery in Queensland. He married to Jean Heather EVANS on 28 August 1937 in Rockhampton. They had six children. Bert Allenbury MAHONEY was born on 16 February 1919 in Rockhampton, Queensland and died on 12 August 1996. It is known that he did not marry or have any children. Margaret MAHONEY died on 1 May 1961 in Rockhampton, Queensland and was buried one day latter in the North Rockhampton Cemetery.